Wolff’s lush illustrations, rendered in watercolor and ink on a palette of soft, natural colors, are presented across two-page spreads and on single pages framed by white borders. They’re calming and lovely; perfect for a quiet, restful story-poem that mostly shows animal families, both familiar (such as cats and foals) and less familiar (such as bats and river otters). At beginning, middle and end, there are human families of varying ethnicities, babies and children of varying ages, and two pages in which a daddy is present. Here, mama nurses her baby in the evening, while daddy snoozes next to her. Here, a little girl munches on a sandwich while she watches her mama breastfeed her infant sibling. Here, a father holds a toddler as they watch a mama hamster nursing her babies. One of the most satisfying things for me is that the English and Spanish versions of each rhyming couplet are different. Rather than being a hokey “translation” that often makes the Spanish in a book for children seem like a mere afterthought, Hernandez’s Spanish is deep and nuanced; it flows beautifully and makes cultural sense. 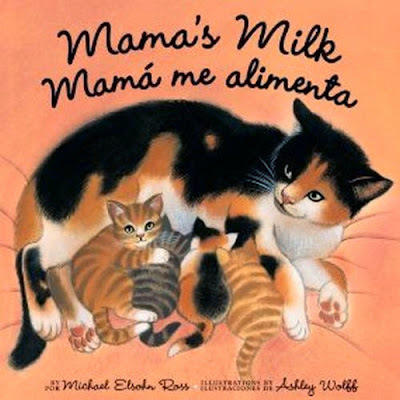 So, for instance, while an English couplet reads: “Cuddle little baby, take a rest/ Fall asleep on mama’s breast,” the Spanish reads: “Ven aquí a mi lado, ven aquí mi amor/ Quédate en mi pecho, duerme sin temor,” which in English would be: “Come here to my side, come here my love./ Stay at my bosom, sleep without fear.” As well, the title reflects two distinct cultures: In English, it’s Mama’s Milk and in Spanish, it’s Mamá me alimenta (“Mamá breastfeeds me”). Nicely done in both languages and highly recommended.